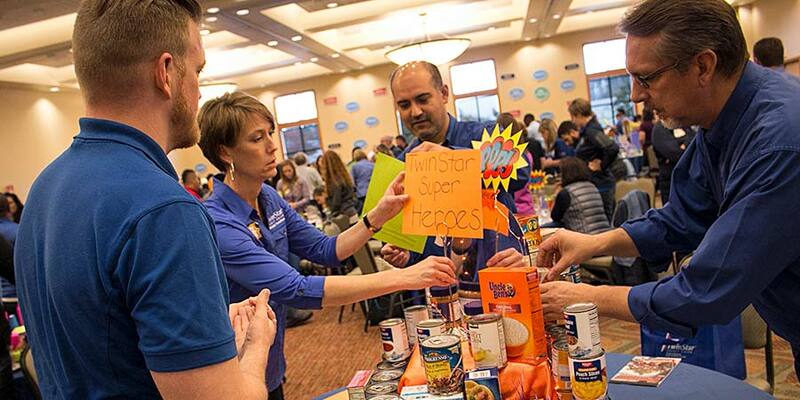 TwinStar's Business Development team works together to create a structure from donated food items in a team-building exercise at the TwinStar Employee Conference. In 2015, 42.2 million Americans lived in households with food scarcity, or low food levels, including households in the Pacific Northwest. * When thinking about hunger, many people often have a specific idea of what someone who struggles with food scarcity is like and what brought them to this point. The reality is probably much different, as Robert Coit, Executive Director of the Thurston County Food Bank, spoke about at TwinStar’s all employee conference on October 10, 2016. Robert told the story of a woman who came into the Thurston County Food Bank seeking help. She was new to the area and struggling to provide for her family. As she waited in the long line - a humbling experience for most - she noticed that in addition to food, the volunteers also had bouquets of donated flowers available. To her, these flowers represented a better time in her life. As she thought about how nice it would be to have the flowers, she began to tear up. When she got to the front of the line, she noticed that all of the flowers had been given away and began to sob. The volunteer, noticing the mistiness in her eyes, pulled out an extra bouquet they had saved and gave it to her. That simple act changed her whole concept of what a community could be. Robert ended with a lesson: For this woman, like many who’ve used the Food Bank’s services, it’s not about the food - it’s about the community. As he told his story, many TwinStar employees had tears in their eyes. Not only because of the story, but because of their desire to do more. Luckily for them, TwinStar believes in giving back to its community. In fact, the theme for the employee conference this year was “Making a Difference Together,” and that’s just what TwinStar did. The walls were covered in signs printed with the names of community organizations TwinStar assisted over the past year. Employees participated in a team building activity using non-perishable food items to build a structure. For this, employees were asked to bring their own items to go along with items provided by the credit union. The activity was fun and helped strengthen team spirit. At the end of the day, TwinStar and its employees proudly donated all the food used in this exercise to the Thurston County Food Bank - approximately 2,900 lbs total. The giving culture of TwinStar is ingrained from the top to bottom of the organization. TwinStar donates nearly half a million dollars annually to the communities it serves. Last year, TwinStar employees personally donated more than 4,500 hours to local non-profits, charities, and churches. TwinStar is proud of its employee’s dedication to their communities, and hopes to use its voice to spread awareness of community needs. Being able to partner with organizations like the Thurston County Food Bank enables TwinStar, its employees, and its members to change lives for so many. Together, we can make a difference for the communities we live in.